I agree with the general idea of what shows insecurity. I disagree about arguing and anger. Imagine you saw someone telling a group of people to do something really dangerous. Would you not argue – to save their lives? That’s not insecurity. And anger can be a cover for many things not only insecurity, like helplessness and pain that is too strong to bear. Therefore the text has been changed from “Everyone” to “Some people”. How true. An inner serenity, or inner peace, is a true sign of a secure person. How simple in concept yet so difficult in practice. is bad.That is natural and unavoidable but what you do with those emotions is completely under your control. Many believe the Dalai Lama’s wisdom is entirely derived from his meditative detachment from anger.I believe it is also derived from his redirection of energy to his cause for peace.Rather than raging against injustice,His Holiness converts his passions by engaging them in constructive actions, such as speaking and writing. Can I say I’ve master this wisdom as His Holiness and capable of redirecting my energy? At times, yes and others no.Yet we’re all yet but students seeking the enlightments in life. feeling anger is totaly cool, it is a part of what we are. For that reason the text has been updated for “Everyone” to “Some people”. Very interesting read! I can admit I am guilty of this. Even though I do display a carefree attitude at times, there are few insecurities that linger inside me. Last weekend I had gone out and did have a bit to drink, and by the end of the night I was just so angry. Anyone was a target! After reading this, I have realized I was feeling very very insecure about a ton of things This is something I should definitely work on. Agreed! Insecurity can really destroy our lives. As a young man, I was terribly insecure. Time has changed that for the best. Self-exploration is addicting! I recently discovered that I have never felt anger from or towards a person. I’ve felt annoyed or in need of space, etc. But anger? For me, it always stems from a physical source, usually pain. And yet, my actions or reactions may mislead, may misrepresent themselves as anger–so well in fact that only through a long process of self-exploration could I distinguish them myself. Stimulating words; thank you for the motivational (read: moving one towards reflection) words. This has came to me at the right time, at the moment I am battling Self Hate. I do believe many people have a form of self hatred though not everyone is open to see it and distracts themselves with things and people. 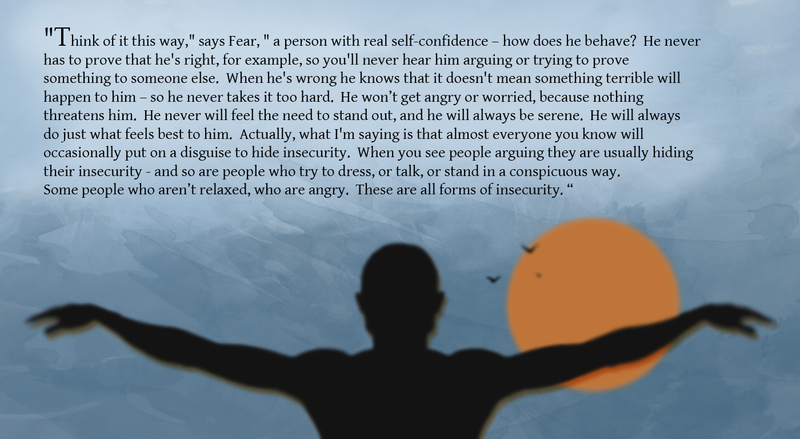 Like the ideals expressed, I suppose for those commenting on “arguing” it also should be noted that it is self-confidence … not general confidence. For example, in the quote it mentions if wrong they know nothing terrible will happen to them, however doesn’t explicitly imply that nothing terrible will happen to others if he is wrong. I agree with the most statements above but one. In my opinion, standing out does not necessarily mean insecurity – on the opposite, it may very well be an expression of confidence and charisma. :-) Peace! Thanks for liking my blog 🙂 This is def something to reflect on, esp me. I think I am the most insecure person in the entire world 🙂 Will keep following you! Each emotion is relevant, We cannot experience Joy with out knowing what it is to be sad.. their has to be opposites, for that is how the Universe is made up. Ying and Yang, Dark and Light, Good and Bad.. Love and Hate.. we need to experience one to know the other..
Not letting those emotions rule us I think is the key.. and understanding what and why we are ‘Feeling’ Emotion ..
We are all of us looking for Balance.. and for that we need to take a look deep within and see how those emotions are and have affected our lives and health and opinions as we have walked our own journey of discovery. Without those emotions and lessons I think many would not be who they are today.. I am glad I ran across this today! Next, will you talk about how to overcome insecurity then? We can point out the issues, but can we also talk about ‘way out’? What about what causing insecurity, etc. etc. Thanks, I love your blog once again. Hi Ido. thank you very very very much for the video , it’s very good and it answers my question. I post it on my face book profile. I doooo thank you so much, so cool cool cool video and you answer my question perfectly. Great post! I am feeling myself at ease now. There is a lot to learn from the comments too. Thank you everyone!! That’s very true and combating it should be a task for those willing to make change. Great post, Ido! I love reading your latest articles. I was wondering if there was any way I could contribute an article to your site? I love what you’re doing and would like nothing more than to be apart of it! I write on my blog daily, so you could go check out my style of writing and let me know if you’d be interested. Thanks! Ido, 3 days ago, I was on day 11 of the workshop I and worked all the way through it, including checking “done” and receiving the “saved” notice, but I didn’t get the last page of reading you usually get after you save. I have received no messages for day 12. And I arrive on an uncompleted day 11 when I go back to the workshop page. 😦 I really want to continue. Can you please look into this for me? I found your “like” on my page, and then was happy to see your blog. Your topics help us to think about important ways to improve our lives and the world around us. I don’t think we need to agree all the time if we respect everyone’s right to his or her individual ideas. Reblogged this on My Thoughts & Experiences. I think it depends upon nature too…an extrovert will behave differently even if he is not insecure,and an introvert,even if he is insecure,would be calm..